Having trouble finding a market for your PowerPoint work? Perhaps you’re struggling to find students for your training service, or clients for your design work. Microsoft MVP Tom Howell says you should’t throw in the towel just yet! My first presentation was not successful. Weeks went into preparing content. I didn’t focus on “mindset” I needed for a great performance. Since then I have developed Communicating with P.O.W.E.R. – my own methodology. Follows these steps and you’ll deliver successful speeches and presentations every time. Want to learn a new skill, a new program, or do you want to look into self-improvement? You are in luck. Why? Because our friends at Udemy, the leading provider of online video courses has slashed the rates of many of their courses to just $15. Many courses that cost more than $200 are now only $15. 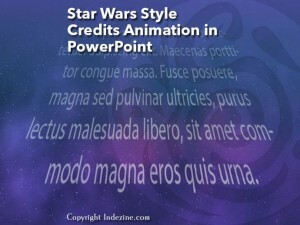 Download and use these Star Wars like slides. If you have a bunch of commands that you use frequently, you may want to keep them more accessible within PowerPoint 2016 by customizing your Quick Access Toolbar — you populate the QAT with commands you use often. Over a period, these customizations may become a valuable asset you want to save or share. Your slides remain the same, yet the various views in PowerPoint make exploring those same slides a little different. This approach makes sense because viewing slides in Slide Show view gives an entirely different perspective than editing them in Normal view. Further, it’s easier to reorder and work with multiple slides in Slide Sorter view and make changes to individual slides in Normal view. All put together, PowerPoint 2016 provides you with ten different views. Eight of these views can be accessed from the View tab of the Ribbon. Among the tabs within Backstage View, we have already explored some options such as Open, New, Save, etc. 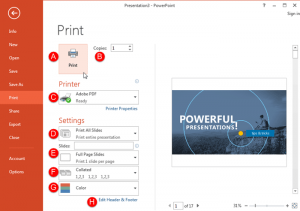 In this tutorial, we will explore the Print option used to print the current presentation in the form of selected slides, notes pages, handouts, etc. Follow this tutorial to learn more about Print options within Backstage view in PowerPoint 2013. Sometimes, you want to know whether you are running a 32 or 64-bit version of PowerPoint or Office. Yes, if you are running a 32-bit version of Windows, then there’s no ambiguity in the fact that you have to be running a 32-bit version of Office. 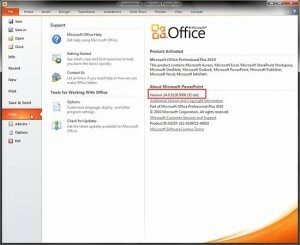 But if you are running a 64-bit version of Microsoft Windows, you may be running a 32 or a 64-bit version of Office. Many sysadmins and even users run 32-bit Office within a 64-bit Windows environment because there are add-ins that may not work in a 64-bit version of Office. Or you may have another reason. Luckily, it’s easy to identify 32-bit or 64-bit if you know where to look. In various versions of PowerPoint, including PowerPoint 2016 for Mac, what’s the one thing that has not changed? Yes, it's PowerPoint's tri-paned interface! So, why is the interface called tri-paned? Are there three distinct regions within the PowerPoint 2016 for Mac interface? Yes, the Slide Area is one of three principal regions in PowerPoint 2016; the other two being the Slides Pane and the Notes Pane.